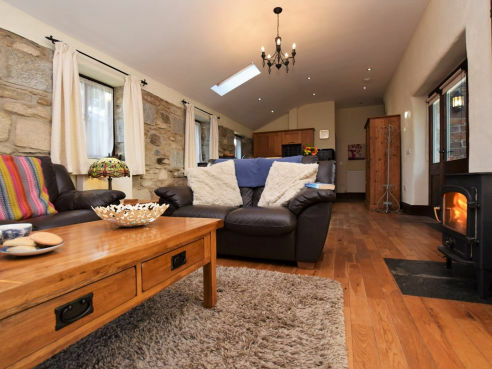 Nestled away in the tiny hamlet of Trebudannon, this charming barn is the idyllic base to relax and unwind Cornish style. 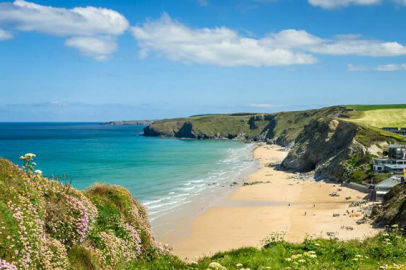 Trebudannon Barn offers an enviable base to explore both North Cornwall with its golden sands and beautiful coastline and the tranquillity of the South coast with its tiny fishing villages and coves. Lovingly converted, this open plan single storey barn is packed full of rural charm combining country cottage chic with more modern order. Sink into squishy leather sofas after the day’s excursions or soak in the garden hot tub, in the cooler months light the woodburner and relax fireside. 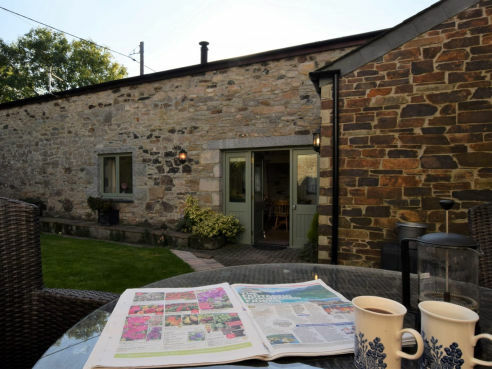 A home from home in all seasons, Trebudannon Barn assures you of a warm Cornish welcome, including your dog. The dining/lounge area has oak flooring, large oak dining table. Large leather sofas, Woodburner, Freeview digital TV, DVD player, CD Player, WiFi, a selection of books and games. Gas fired central heating throughout. Spill from the sitting room to the pretty enclosed private garden blooming with colour and fragrance in the summer months. Plenty of parking. Storage to house own bikes/surfboards. 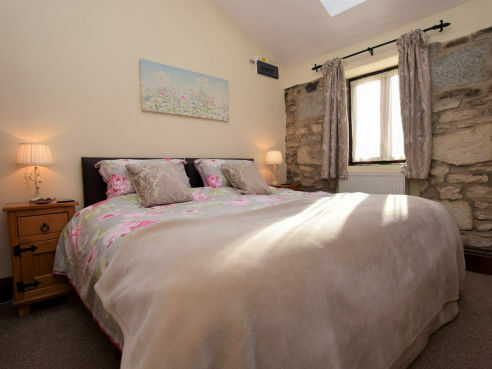 Two bedrooms, both offering king sized zip/link beds. Bed linen, towels and fluffy bathrobes included. Dogs are not allowed in the bedrooms. 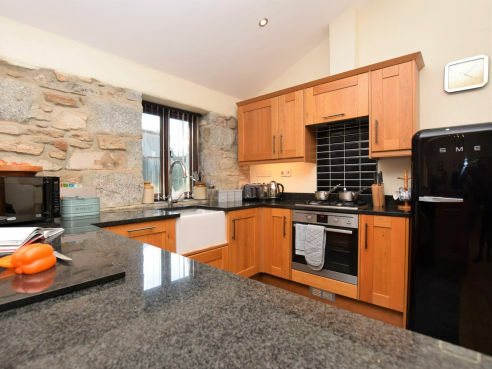 Fitted oak kitchen with granite worktop equipped to a very high standard, includes electric oven, gas hob, microwave, washing machine, SMEG fridge freezer and dishwasher. 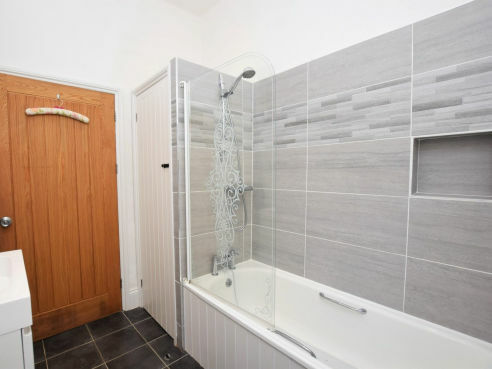 There is a spacious ensuite wet room and also a family bathroom with bath and electric shower. Logs for woodburner. 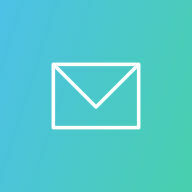 Shop 1m. Pub 2m. 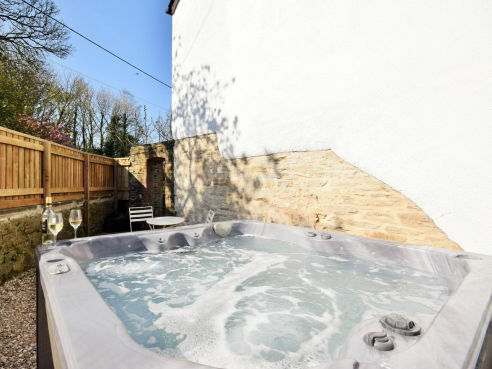 Patio with seating/barbecue stand together with own hot tub tucked away in a private little courtyard area. 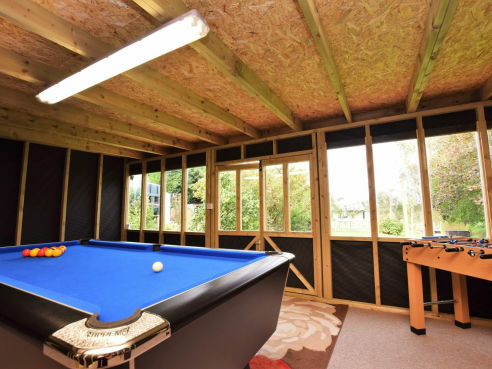 Guests have use of the shared games room with pool table, dartboard, table football and bluetooth speaker. No smoking policy throughout the properties. 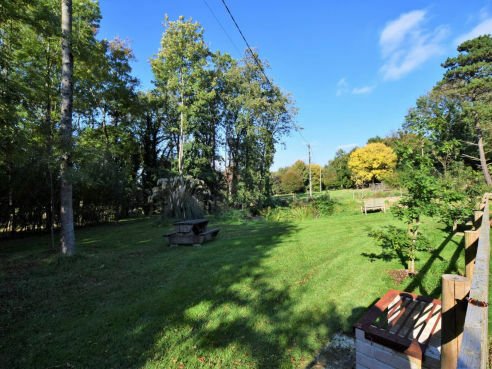 There is a woodland/orchard area for guests to enjoy with seating areas next to two pleasant ponds. 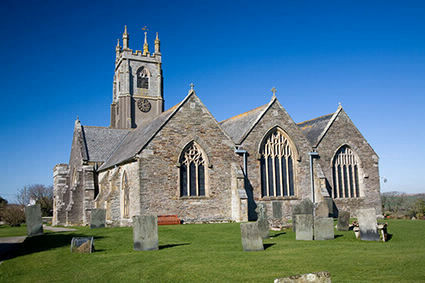 Trebudannon is situated within an hour of all coastal towns and villages, including Newquay, or the many little pubs in St. Columb together with its shops and fifteenth century church. There are many outdoor activities locally including horse riding, coarse fishing and golf, the beaches and coastal walks, while a convenient distance are National Trust Houses and Gardens. Nearby Newquay (5 miles) offers many facilities including an indoor fun pool and swimming pool, squash, tennis, bowls, golf and boating lake. 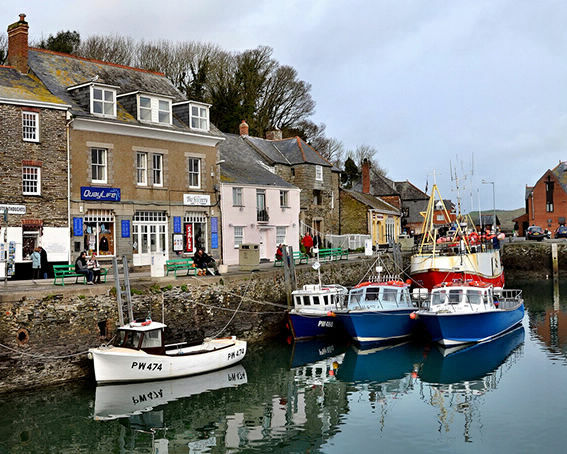 Padstow and the Camel Estuary, 8 miles to the north is a traditional Cornish fishing port. The Camel Estuary is ideal for water sports, pleasure and fishing trips. The ferry runs from Padstow to Rock. Joining Padstow by the Camel Trail is the lovely town of Wadebridge. The Camel Trail, route of the old Padstow to Bodmin railway, offers hours of pleasure for cycling, walking and bird watching. Cornwall has much to offer, as well as the beautiful beaches and stunning scenery, there are plenty of opportunities to enjoy your favourite sport, or you could try something new such as kite surfing. 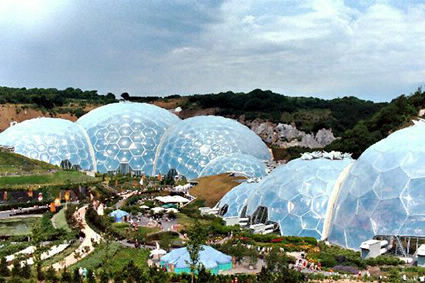 Places of interest vary from art galleries and national trust properties to the fantastic Eden Project which has been hailed as the 8th Wonder of the World and is something not to be missed. There are a number of delightful country walks in the surrounding area or you can travel further afield and take the coastal path and enjoy the breathtaking scenery and as the path winds down to little coves, rest a while and absorb the magic of Cornwall. 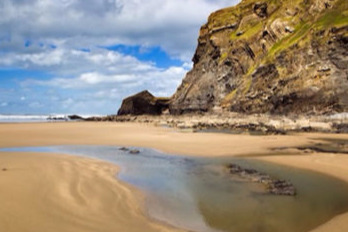 Watergate Bay is one of the finest surfing beaches in Cornwall being a two mile stretch with facilities to hire surfing equipment and Mawgan Porth which is a lovely beach resort and is ideal for bathing and surfing. These are but two of the many beaches available locally. Come and go as you like. Nobody will worry you. For the duration of your stay this is your own place in the country near the sea.